Okham's Razor is an acoustic duo with a folk-rock sound and intelligent, conversational lyrics. The first thing you notice is the harmony. Roy and Eric have mastered the art of two part harmonies and their vocal abilities are in line with groups such as the Jayhawks, Crosby-Stills-Nash, the BoDeans, Indigo Girls, and Simon and Garfunkel. Roy's voice has the raspy elements of Chris Smither and the grit of Mark Knopfler. Eric's voice is more a mix between the passion and power of Patrick Monahan (Train) and the soul of Marc Cohn. Beyond channeling voices, their acoustic guitars take on a whole different life with Roy on 12-string and Eric on 6-string. Roy's guitar work is smooth and mysterious. It displays influences from the Beatles to Yes to contemporary artists such as Counting Crows and David Gray. Eric has more of a crunch intense style to his guitar work. His influences range from Dave Matthews to Neil Young and Wilco. The songwriting aspects are interesting because Roy is a lyric machine and Eric is more a music thinker. Each song comes from a variety of situations, thoughts, angles and dreams. Okham's Razor's ability to draw from many genres of music provides a variety that is not seen with most artists. This melting pot of styles has pulled a fan base from country, rock and folk listening pools. Wow! Where did these guys come from? The short blurb about the music changing as fast as the weather is right. It's great that both of these guys sing, because it keeps you from getting bored with one voice. I also like the arrangement of instruments. Best stuff is the bongo-conga beat vs the drums. The writing really makes you think, too. I'm ready to meet the Oriental Girl. I am very surprised by this album!!! I heard about this acoustic duo from a friend of mine and so I decided to take his advice and pick up a copy. The first 3 songs totally blew me away. Intelligent lyrics and solid music throughout the disc. "Under The Hammer and Sickel" is an awesome song period. This CD is interesting because it encompasses so many styles of music. I'm excited to see these guys live!!! Top ten on my play list. If you like music ranging from Dave Matthews to Steve Earle, if you like sounds ranging from tight vocal harmonies to solid bass lines, if like lyrics ranging from social commentary to sublime reflection; you will love this CD. Intreguing words and arrangements. Cohesive play list and playing. Solid and soulful musicians and sounds. Top ten on my play list! The whole Two's A Perfect Number CD is filled with interesting songs, varied vocals and nice harmonies. Roy and Eric complement each other nicely on instrumentation and vocals. The lyrics can be darkly funny (Single Finger Salute and Ode to Bob Barker) and/or evocative like "Walk to the edge where the pavement turns trail" (Under the Hammer & Sickle). Chattanooga, Tennessee makes me wonder if I should at least visit there to see if I agree with the song. 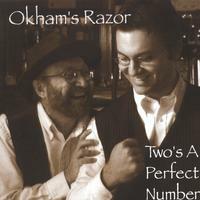 Two's A Perfect Number is easy to listen and Okham's Razor live shows are great fun though I've seen them only at the Perfect Pint.